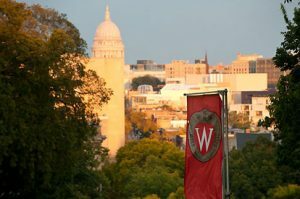 The University of Wisconsin at Madison Department of Philosophy is a collegial group of a dozen and a half faculty members, over fifty graduate students, and nearly two hundred undergraduate majors. Our faculty members enjoy international reputations in their areas of expertise, and every one teaches the full range of courses, from introductory classes to graduate seminars. Our graduate student community represents an extremely talented and congenial group of young philosophers with diverse philosophical and non-academic interests. The number of undergraduate Philosophy majors has steadily risen over the past few years; our majors receive a thorough education that emphasizes the development of critical thinking and effective communication skills.